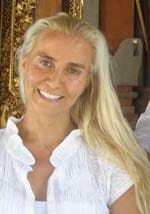 Therese Poulsen, Founder and Director, Breath of Hope Foundation, Inc & internationally recognized yoga master and holistic healer. In the aftermath of the 2004 tsunami, Therese realized that her unique background in teaching and holistic healing might give her the means to make a difference in the shattered lives and their distressed communities. She knew that material relief efforts, however vital, would never address the inner devastation caused by the tsunami and the forever-changed world it would leave behind. Her mission became clear: to rebuild shattered hope – to help repair distressed bodies, psyches, souls, and lives – from the inside out. In July 2005, drawing on her leadership skills & her passion for making a difference in the world, Therese established numerous Breath of Hope program sites at schools, orphanages and community centers in Sri Lanka and Indonesia. Listen to this episode of Leading Conversations with Cheryl Esposito to learn about the phenomenal results!